Harpocrates Speaks: A Bowl of Measles? Super! A Bowl of Measles? Super! Last November, there was a flurry of blogging and news about a rather strange approach to children's health: mailing chicken pox-contaminated lollipops with the aim of infecting one's child. All the problems of violating laws regarding the sending of infectious materials by mail aside, there are numerous other reasons that giving someone else's used lollipop to your kid in order to get them sick. The most obvious is that if the virus actually survives, an infection with the varicella zoster virus is not without risks. A successful infection promises the likely recurrence of the virus later in life in the form of shingles. These are all much higher risks than from the vaccine. The other big concern with posted pox pops is that you don't know what other viruses or bacteria may be present. Food-borne viruses, like Hepatitis A, might just be waiting for an unsuspecting victim. As foolish as mailing chicken pox-laced items by post is, what really surprised me was that people were actually looking for measles as well! Chicken pox is generally mild, and the serious complications tend to be a bit rarer, but measles can be quite dangerous. I imagine that if a cereal like Rubeoleos, tasty Os sprinkled with rubeola virus, actually existed, these parents who have been so frightened away from vaccines and led to believe that childhood diseases are benign by organizations like NVIC or Age of Autism would be gobbling it up, so to speak. 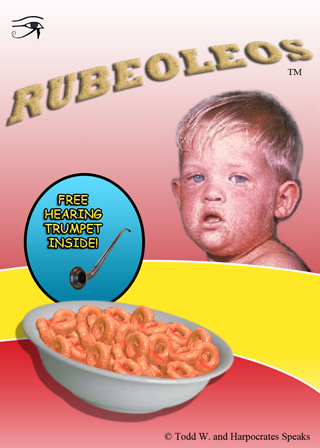 While a hearing trumpet (or hearing aid) could be included in the box, parents would probably have to collect box tops for the medical attention their children may require should they suffer more serious complications. Yet in spite of the dangers of the disease, an underestimation of the virus' risks and ability to spread quickly would not stop them from serving up a big bowl to their dear little darlings. A super bowl, perhaps. Which brings us to Indiana. As you may recall, my last post discussed a small outbreak in Indiana connected with two individuals that visited the Super Bowl Village. The two teens had not been immunized against measles and were infected and contagious as they wandered about the festivities. At the time, these were the only two confirmed cases, while there were two other suspected cases. On February 13, there were 10 confirmed cases. On the 15th, it was 13 confirmed, and then 14 confirmed cases of measles on the 20th. The number of confirmed cases now stands at 15 (as of Feb. 24, the case total is up to 16). All of them are connected to the initial case identified earlier this month, though the Indiana State Department of Health states that the subsequent cases have, thus far, not been connected to exposure at the Super Bowl Village. I wrote to the Department of Health to try to get more details on the outbreak. They confirmed what I suspected: all of the cases are either unvaccinated or have unknown vaccination status, though they could not verify the exact breakdown the first 13 cases had all refused the MMR, according to a story by PBS. Other than reports that the first two cases were teens, and that the latest two cases were adults 14th case was an adult, ages and familial relationships were unavailable. What impresses me about the most recent case is that the individual parents of the child, after discovering that he or she had been exposed, took the step of going into self-isolation isolating the child, thus preventing the spread of measles to others, even while asymptomatic. (Measles, you may recall, can be spread for up to 10 days before any rash appears.) So far, the outbreak has been confined to Boone and Hamilton Counties. This is the second sizable outbreak seen in Indiana in under a year. In June-July, 2011, northeastern Indiana (Noble and LaGrange Counties) saw an outbreak totaling 14 cases, 13 of which were all unvaccinated members of an extended family, including one woman who was 32 weeks pregnant and needed to be hospitalized. In a similar vein, Minnesota saw the largest measles outbreak of 2011, with 21 cases, again, predominantly in unvaccinated individuals. In fact, in each of these instances, the index case had not been immunized against the disease. Looking at these outbreaks, a reasonable individual might think, "Hey. These outbreaks could probably have been prevented altogether if everyone got vaccinated." I wondered (though not too earnestly) how one of my twitter followers would react to this latest outbreak. This individual is a pediatrician who is, if not blatantly anti-vaccine, exceptionally sympathetic to the anti-vaccine movement, eagerly jumping on any new paper or news article that appears to support his reservations about vaccines, even when a closer read shows they actually don't. I'm speaking, of course, about Dr. Jay Gordon. So, I posed to him my question, simply, "how would you recommend preventing outbreaks like the current on in Indiana from occurring in the future?" I no longer give or recommend the MMR vaccine. I think that the risks exceed the benefits. Obviously, discuss this with your doctor but please know that the CDC declared rubella officially eradicated in the U.S. in 2005, measles remains a rare disease in America (30-40 cases/year) and mumps is also not very common. Mumps can cause decreased fertility in teenage boys who get the illness and suffer testicular infection, but this is a very rare occurrence. All three of these viruses continue to be associated with severe life-threatening complications in other countries, but the vaccine—including the "split" vaccines—enough risk to outweigh the benefit for healthy North American or European children. What question are you answering, Jay? 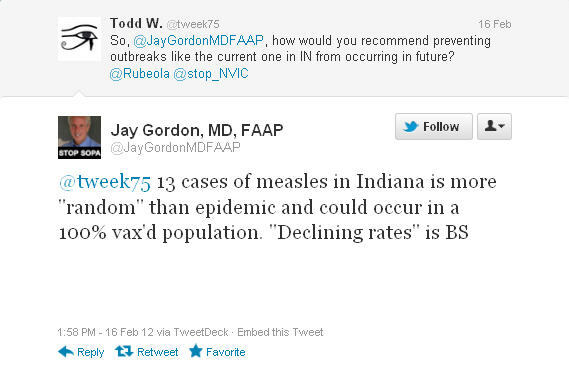 While his response is, technically true in part (since nothing in medicine is ever 100%, there could, possibly, be an outbreak of 13 cases in a fully vaccinated population, though this is exceedingly unlikely), he not only ignores my question, but also ignores the reality of each and every outbreak that has occurred in recent years in the U.S.: that lack of vaccination of the individuals led to the disease's spread. I pick on Dr. Gordon because, well, he's quite vocal about his views and has a level of fame (or infamy). The sad truth, however, is that there are likely a number of other doctors and assorted health professionals out there who, contrary to the science and standards of their profession, recommend against immunization. This is, in my opinion, highly irresponsible. I've said it before and I'll say it again. Outbreaks of measles and other diseases do not need to happen. We can safely prevent them through immunizations. Yet there are those who, like Dr. Gordon, work against such efforts and ensure that society is not optimally protected against these diseases. The ironic part of their opposition is that for some diseases (measles is a prime example), adequate worldwide vaccine uptake would, eventually, eliminate the need for the vaccine altogether, since the virus only infects humans. We did it with smallpox, we can do it for other diseases as well. So by fighting immunization in the way they do, anti-vaccine activists and their sympathizers only prolong our need to immunize. There have been no cases of measles reported in New York City among people who were at Super Bowl Village. The last reported measles case in New York City was identified in the beginning of January and it was imported from another country.